Inspired by the visual richness and cinematic structure of the Hollywood musical, Blame This on the Boogie chronicles the adventures of a Filipino American girl born in the decade of disco who escapes life’s hardships and mundanity through the genre’s feel-good song-and-dance numbers. Rina Ayuyang explores how the glowing charm of the silver screen can transform reality, shaping a person’s approach to childhood, relationships, sports, reality TV, and eventually politics, parenthood, and mortality. Ayuyang’s comics are as vibrant as the movies that she loves. Her deeply personal, moving stories unveil the magic of the world around us—rendering the ordinary extraordinary through a jazzed-up song-and-dance routine. Ayuyang showcases the way her love of musicals became a form of therapeutic distraction to circumnavigate a childhood of dealing with cultural differences, her struggles with postpartum depression, and an adulthood overshadowed by an increasingly frightening and depressing political climate. 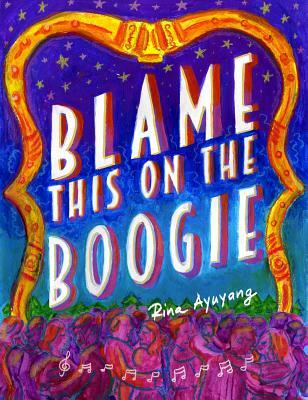 Blame This on the Boogie is Ayuyang’s ode to the melody of the world, and shows how tuning out of life and into the magic of Hollywood can actually help an outsider find her place in it. Born and raised in Pittsburgh, Rina Ayuyang was always inspired by the Sunday funnies and slice-of-life tales. Her short stories have been nominated for the Ignatz and Eisner Awards, and she has been honored with a MoCCA Arts Festival Awards of Excellence Silver Medal. Her comics have appeared in Mutha Magazine and The Comics Journal. She is also the publisher of the micro-comics imprint Yam Books. Her first book was Whirlwind Wonderland. Ayuyang lives in Oakland, California, with her husband and son.